TRENTON, N.J. (AP) — Exhausted commuters pointed fingers and demanded answers Friday, a day after a modest snowstorm stranded motorists on slippery roads for hours, paralyzed the public transit network serving New York City and its suburbs and even forced some New Jersey children to stay overnight in their schools. How, they asked, could a few inches of snow in a region used to this sort of weather lead to such chaos? “Clearly we could have done better and we will do better,” New Jersey Gov. 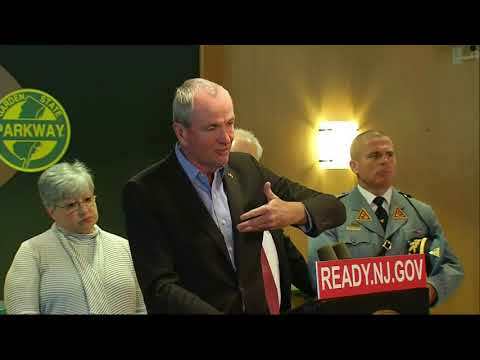 Phil Murphy said. “We’re all unhappy with what happened,” he said. The storm, which had earlier socked the South and Midwest, swept into the New York City metro area just before the evening commute Thursday before heading north into New England overnight. The snowfall totals were modest in most places — 6 or 7 inches (15 or 18 centimeters) — but it was unusually icy and thousands of slow-speed car crashes led to gridlock that made it tough for plows to get through. In West Orange, New Jersey, more than a hundred students stayed late into the night, some until morning, at a middle school after buses became stranded for hours and turned back. Staffers stayed overnight and made dinner for students who couldn’t get home. “It was so long, I’m just excited to go home and go to sleep,” student Breanna Dannestoy told NBC New York. Some New York City schoolchildren were stuck on buses for up to five hours. The last one got home at 3 a.m. Friday, Schools Chancellor Richard Carranza said. Murphy, a Democrat, said “lousy” forecasts were partly to blame. He took a pounding on social media from people complaining about his handling of the storm, including one of his highest-profile constituents. Former Gov. Chris Christie, a Republican, tweeted at Murphy that it took him nearly six hours to travel roughly 30 miles (48 kilometers). Murphy didn’t respond directly to his predecessor. Gary Szatkowski, former chief meteorologist for the National Weather Service in New Jersey, said on Twitter that it was the state’s poorly executed snow removal plan, not meteorologists, who screwed up. “They were planning to clean up while freezing rain/sleet were pouring down out of the sky. That’s not a plan; that’s a recipe for disaster,” he tweeted. De Blasio, a Democrat, said forecasts had led city officials to expect just an inch of snow. That meant city buses weren’t equipped with snow chains and salters weren’t out treating the roads ahead of the storm. The wintry weather also caused a traffic nightmare in Pennsylvania, with numerous vehicles stuck for several hours from the Lehigh Valley to the New Jersey state line. Police sometimes drove on the opposite side of the highway, honking their horns to wake up drivers who had fallen asleep while sitting in traffic. Tens of thousands of businesses were without power Friday in Pennsylvania, mostly in the western part of the state. Among the odd storm sights there was a camel named Einstein. The animal was en route to an event put on by a Jewish organization when the vehicle he was traveling in became stuck north of Philadelphia, the group said. Einstein was not able to make it to his destination, as his handlers turned back to Peaceable Kingdom Petting Zoo where they started. Some drivers woke up in their cars Friday morning after being stuck overnight on the Major Deegan Expressway in the Bronx. A multicar pileup on the George Washington Bridge partially choked off one of the three vehicle crossings across the Hudson River. Buses stopped running, causing New York City’s major bus terminal to fill with passengers to such dangerous levels that officials closed the doors and had people line up around the block. As many as 17 inches (43 centimeters) of snow fell in some areas of upstate New York. Many schools in upstate New York and northern New England were delayed or closed. In Vermont, aside from the region’s traffic nightmare, the storm was a boon for Vermont’s ski resorts. Okemo Mountain and Stowe Mountain Resort opened Friday as the snow continued to fall. Sugarbush is opening Saturday. Killington Resort is already open and other ski areas plan to open later this month. Some areas of Massachusetts received more than 9 inches (23 centimeters) of snow in the storm, which turned to rain overnight to complicate the morning commute. State police said a stretch of the Massachusetts Turnpike east was closed Friday morning after several tractor-trailer crashes. Associated Press writers Lisa Rathke in Montpelier, Vt., Karen Matthews in New York, David Porter in Newark, N.J., Bob Salsberg in Boston, Kathy McCormack in Concord, N.H., and Mike Catalini and Bruce Shipkowski in Trenton, N.J., contributed to this story.